TWO Masterminds to choose from! Marion and Carterville Mastermind signups open! Grad Spree needs YOUR help! Space available for your business on the Chamber's digital sign AT REDUCED PRICE! The Marion Chamber of Commerce is happy promote members on the homepage of the Chamber's Web site in the Member Spotlight section for $150. Make your lunch count! Join us for a webinar! Ice Cube coming to SIU April 28. Buy tickets AND support the Marion Chamber! Looked into saving money on your electricity and natural gas bills with the Marion Chamber's Electricity and Natural Gas Aggregation. Click here to learn more. Found us on: Facebook, Twitter, LinkedIn, and Google+? Seen or shared our Marion Profile Book? Click here! Filled our our Member Survey? Completed your Traffic Catcher System? Click here to see who has and to learn more. Familiarized yourself with our Member Benefits? Click here to read about them! Seen your Member-to-Member Discounts? Click here to save! Promoted yourself to Marion Chamber members? Click here to learn more. Displayed your "Member of the Marion Chamber of Commerce" window decal at your business? If you need a new decal, click here or email assistant@marionillinois.com. 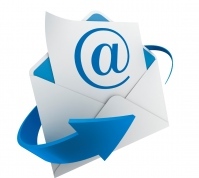 Email director@marionillinois.com, call 997-6311 or fill out this form to schedule your BAH event today! The Marion Chamber of Commerce Marketing Committee members have drastically reduced the cost to advertise on the Chamber's digital sign. The Marion Chamber of Commerce makes the electronic sign available for rent to a wide variety of Chamber members, local businesses, organizations, community groups and residents. Ads can be up to 2 lines of text with the typical line containing about 18 characters (including spaces). Ads run twice for 15 seconds each on a 5-minute loop. We allow for a maximum of 10 ads, which means each ad is live on the board 576 times every day and approximately 17,520 times per month. The sign runs 24/7 so your message gets greatest exposure. All ads must be paid in full before the advertisement goes live. 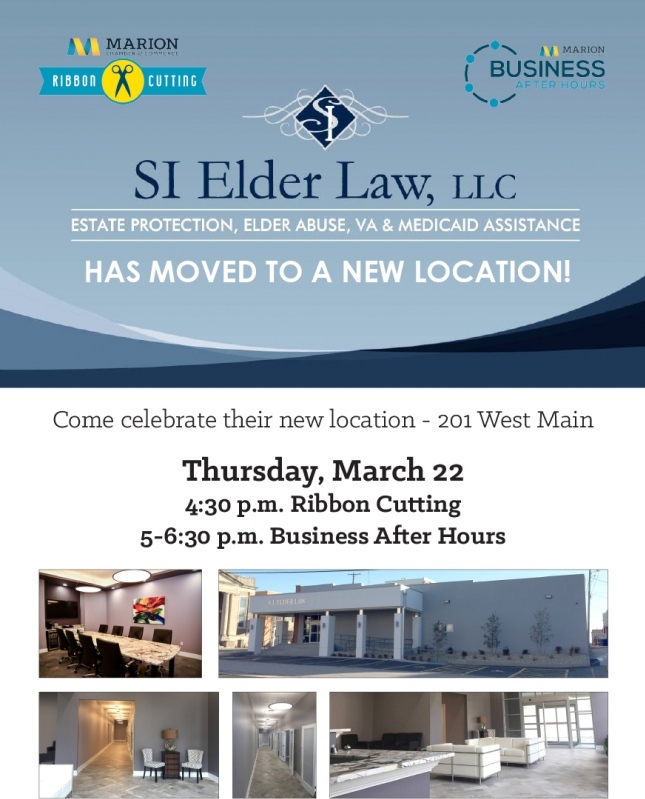 A Ribbon Cutting and Business After Hours event will be held on Thursday, March 22 at SI Elder Law celebrating their new location - 201 West Main, Marion. The Ribbon Cutting will be held at 4:30 p.m. and the Business After Hours will follow until 6:30 p.m.
Click the image below to RSVP. 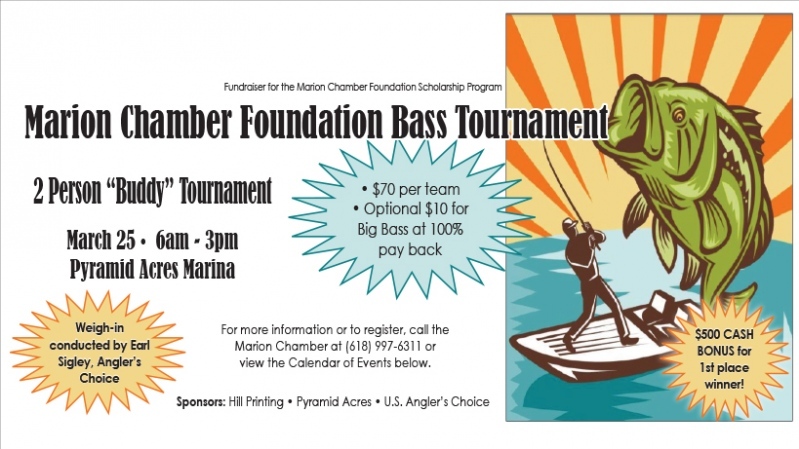 The Marion Chamber of Commerce Foundation is sponsoring the 8th annual two-person Bass Tournament at Pyramid Acres Marina on Sunday, March 25. The event is a fundraiser for the Marion Chamber Foundation. The tournament fee is $70 per team and optional $10 for Big Bass at 100% pay back. Entries will be limited to the first 150 teams. There is also a $500 cash bonus for first place! 30% of the entry fees will go toward the Marion Chamber Scholarship Program. The Marion Chamber of Commerce currently offers two scholarships: John A. Logan College Two Year Tuition Waiver and a Grad Spree Scholarship. The Marion Chamber of Commerce Foundation awards these scholarships based on the amount of money generated by the fundraising efforts from the previous year. Click the image below to register. 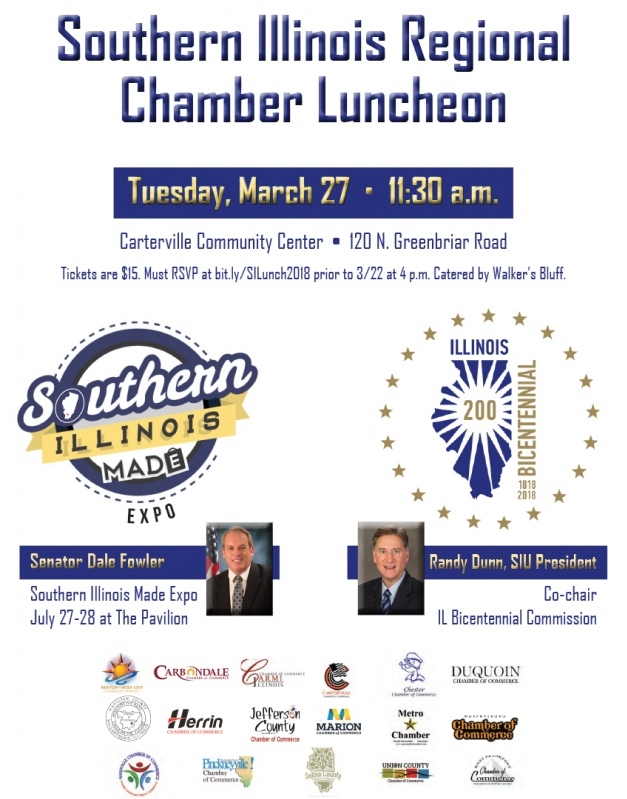 The Southern Illinois Regional Chamber Luncheon will be held on Tuesday, March 27 at 11:30 a.m. at the Carterville Community Center, 120 North Greenbriar Road. Registration is $15. Registration and payment required by March 22 at 4 p.m. No payments will be accepted at the event. Registration is nonrefundable. The program will include a presentation about Southern Illinois Made Expo by Senator Dale Fowler and a presentation about the Illinois Bicentennial Celebration by Illinois Bicentennial Commission Co-chair Randy Dunn. Grow yourself and make an impact on others! 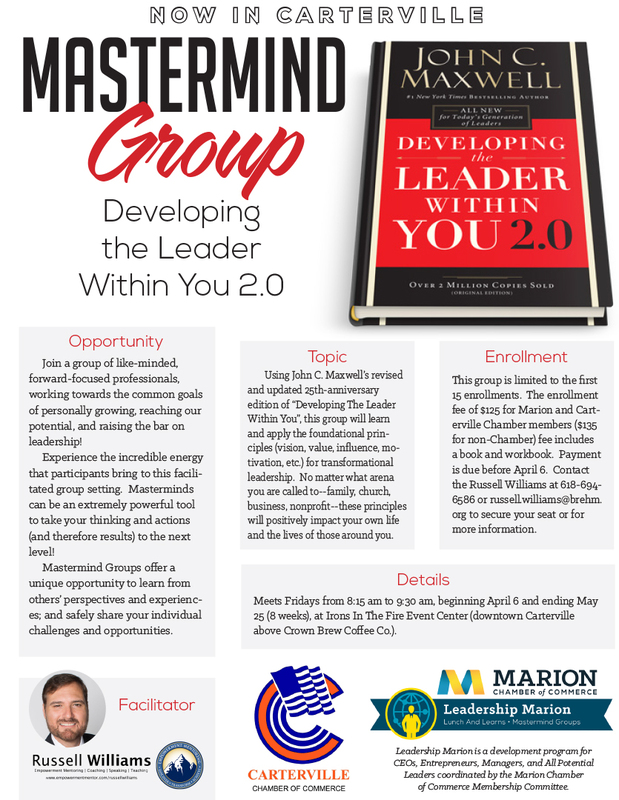 Mastermind Group 2 signups are open now for Marion and Carterville groups! CARTERVILLE: The Marion Chamber of Commerce and the Carterville Chamber of Commerce have teamed up to host the second 2018 Mastermind Group on Fridays from 8:15 - 9:30 a.m., beginning April 6 and ending May 25 (8 weeks), at Irons in the Fire Event Center (above Crown Brew Coffee Co.) in downtown Carterville. This group is limited to the first 15 enrollments. 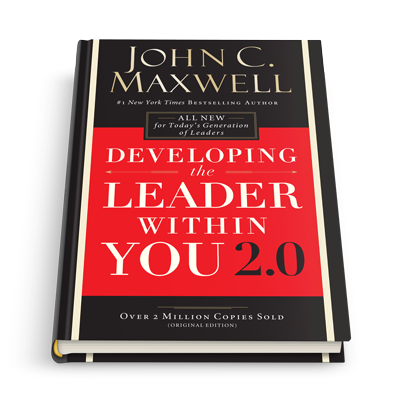 The enrollment fee of $125 for Marion & Carterville Chamber members ($135 for non-Chamber) fee includes a book and workbook and is due before April 6. Register by clicking here or emailing Russell Williams at russell.williams@brehm.org. 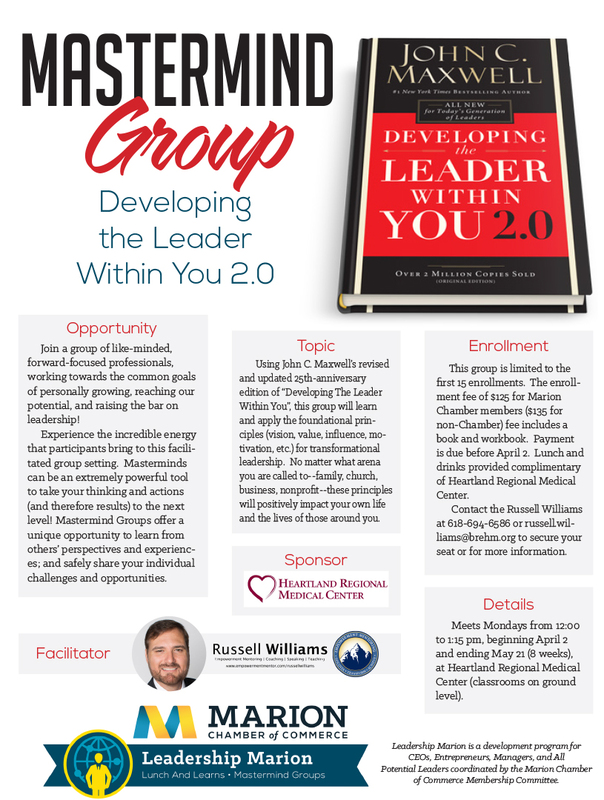 All registrations for Mastermind Groups are now handled by Russell Williams. Click here for the Carterville Mastermind Group flier. MARION: The Marion Chamber of Commerce will host the second 2018 Mastermind Group on Mondays from noon to 1:15 pm April 2-May 21 (8 weeks) at Heartland Regional Medical Center downstairs classrooms. This group is limited to the first 15 enrollments. The enrollment fee of $125 for Marion Chamber members ($135 for non-Chamber) fee includes a book and is due before April 2. Lunch and drinks provided complimentary of Heartland Regional Medical Center. Register by clicking here or contact Russell Williams at 618-694-6586 or russell.williams@brehm.org to secure a seat or for more information. All registrations for Mastermind Groups are now handled by Russell Williams. Click here for the Marion Mastermind Group flier. The Marion Chamber of Commerce Legislative Affairs Committee is hosting Illinois Department of Employment Security Director Jeff Mays on Thursday, April 5 from 3:45 - 5 p.m. at The Pavilion. The presentation will include an interactive Q&A with the audience. RSVPs are required for this event by Tuesday, April 3 at noon. This event is open to members of the Marion Chamber of Commerce. Click here to register for Chamber Day. 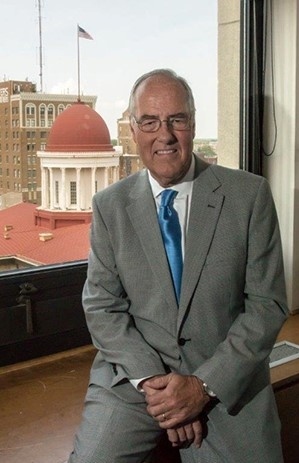 Primary and gubernatorial politics are shaping the policy debate in Springfield and will have lasting implications on the business community. On Wednesday, April 11th, join us in Springfield for our first ever Chamber Day - an advocacy event to let lawmakers know we must be heard in any major policy decision impacting Illinois employers. A delegation from the Marion Chamber of Commerce Legislative Affairs Committee will be in attendance at the Chamber Day event in Springfield. Also, the Committee has coordinated a tour of Capitol after Chamber Day concludes. Please email the Chamber if you would like to participate in the tour of the Capitol. 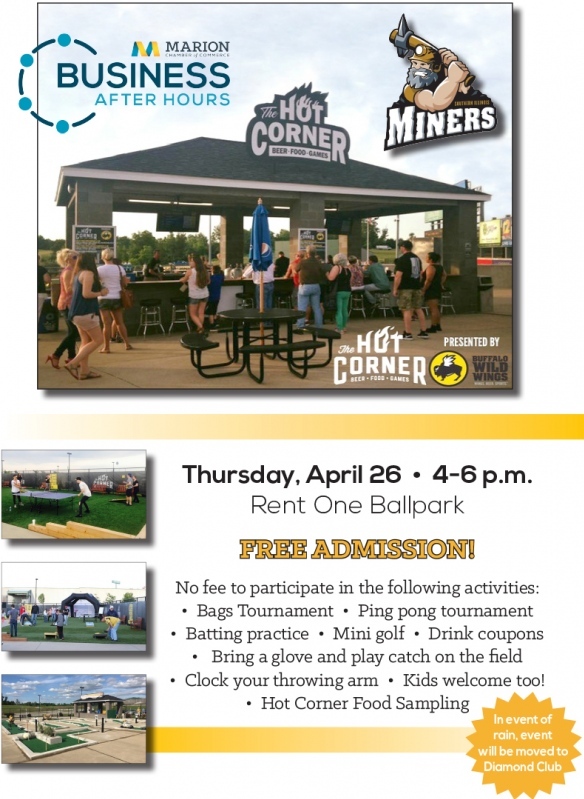 A Business After Hours program will be held on Thursday, April 26 from 4-6 p.m. at Rent One Ballpark. Free admission for all guests! No fee to participate in the following activities: bags tournament, ping pong tournament, batting practice, mini golf, catch on the field (bring your glove), clock your throwing arm and Hot Corner food sampling. Kids welcome too! In the event of rain, the event will be moved to the Diamond Club. Every quarter the Marion Chamber of Commerce Membership Committee holds a New Member Quarterly Luncheon. This quarter’s New Member Quarterly Luncheon will be held at noon at Pookie's Burger Bar Bocce, 109 N Madison, Marion, on Tuesday, May 15. RSVPs are required to ensure enough space is reserved for our gathering. New Member Lunches are held on the 3rd Tuesday, quarterly (February, May, August, and November), and coordinated by the Marion Chamber of Commerce Membership Committee. New members’ lunches will be paid for by the Chamber. We hope to see you there! Marion Chamber of Commerce Membership Committee members will be on hand to answer all of your questions about the Chamber, its events, committees, member benefits, etc. Feel free to bring your Membership Packet and any questions you may have about the Chamber to the meeting to get your questions answered. 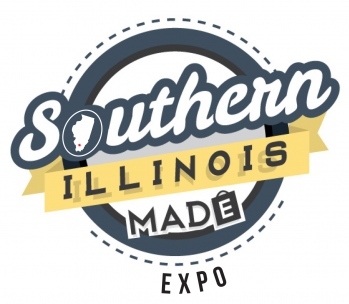 We are excited to invite you to participate in the Southern Illinois Made Expo on Saturday, July 28 from 10 a.m. to 4 p.m. and Sunday, July 29 from 10 a.m. to 4 p.m.
Read more about it by clicking here! The Marion Chamber Foundation presents the 2018 Friends For Life Graduation Spree on Thursday, May 17 at the SIU Rec Center. Marion High School Class of 2018 sign up for Grad Spree here! And, join the event on Facebook at: http://bit.ly/GradSpree! This year, we have many exciting things planned for our graduates. Brian Madrid, a world class hypnotist, will provide a hypnosis show for the seniors. During the show, the volunteers will become the stars of the show with hilarious moments and inspire every person to live life to the fullest. Brian’s past clients include Toyota, Royal Caribbean International, Celebrity Cruise Line, Riviera Maya Resorts and Visionary Wealth Advisory. Also performing during Grad Spree is Raquel, a Nashville, Tenn. based singer and songwriter. Raquel can be found on Facebook: @RRaquelOfficial and on YouTube: bit.ly/RaquelOfficial. Also, while at the SIU Rec Center, the graduates can participate in: swimming; rock climbing; dodge ball tournament; volleyball tournament; a game room; food (from Say Cheese and La Rana Grill food trucks), drinks and snacks; and much more! All of this is provided to each Marion High School graduate free-of-charge. The cost to provide this event last year was approximately $12,000 with the average cost being about $130 per student. Marion Grad Spree would not be possible without the help of our Chamber and community members. We are writing to you today to request donations of funds to help cover the cost of the event and door prize items to giveaway to seniors throughout the night. To donate, click here. For businesses and individuals, we have the following sponsorship levels available: Silver-$250, Gold-$500, and Platinum-$1000+. Of course, any amount is appreciated. We will honor our Gold & Platinum Sponsors by including their name and link to their Web site in Grad Spree promotional materials, on our website, newsletter and email blasts. A donation statement for your taxes is available upon request. To donate, click here. Also, please consider volunteering to chaperone during this year’s Grad Spree. Last year, more than 30 people volunteered to chaperone this annual event. We anticipate needing at least 30 chaperones again this year. Any time you can volunteer will help make this a memorable night for the seniors. Grad Spree will be held from 10:30 p.m. until 4 a.m. on May 17 at the SIU Rec Center. Chaperons are needed from 9 p.m. until 5 a.m. Individuals may sign up to supervise the graduates all night (9 p.m. report to Rent One ballpark, 10 p.m. - 4 a.m. at the SIU Rec Center, 4-4:30 a.m. on bus to Rent One ballpark), during signup (9-10:30 p.m. at Rent One ballpark), or at SIU Rec Center only (9 p.m. - 4 a.m). To sign up to volunteer, click here (or download here), call the Chamber at 997-6311 or e-mail the Chamber at director@marionillinois.com. Encourage your employees, friends and clients to help support Grad Spree as well! Display your support of the 2018 Grad Spree event on the marquee/sign at your business. 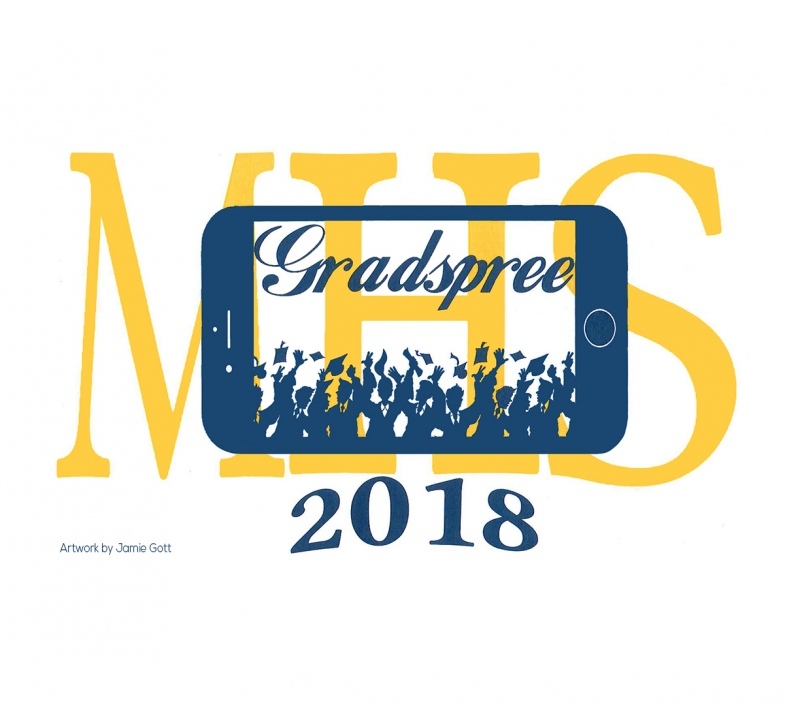 Here is the official 2018 Grad Spree logo designed by Jamie Gott, a Marion High School art student. The Marion Chamber of Commerce Grad Spree Committee is proud to offer this event to our graduating seniors. We have kept our seniors safe for more than 30 years.